The design of the formal garden is very important. The overall shape should be regular, divided into a number of equal sections to form a repetitive pattern. There should be a focal point; usually in the centre, though not necessarily. The epitome of a formal herb garden is the knot garden, which is purely decorative. Bushy herbs in contrasting colours are planted to form low hedges which run through and over each other in complex patterns like ropes forming a knot. Knot gardens need to be viewed from above for the best effect: if you have a suitable garden—and an orderly mind!—they can be most effective and impressive, and are not as difficult to lay out as they look. When planning a knot garden it really is essential to draw it to scale on paper first. Plant the marked lines with suitable herbs such as santolina, wall germander, hyssop and lavender. Buy small but bushy plants and set them about 8-15 cm (3-6 in) apart, depending on size. At the planning stage, decide which ‘rope’ runs over or under at each intersection: generally each one goes under and over alternately to give an entwined effect. If you just impose the circle on top of the loops, on top of the diamond, this is not a true ‘knot’. Clip the newly planted ‘ropes’ back quite hard to encourage even, bushy growth, and trim the plants very regularly in the growing season. The spaces between the ‘ropes’ can be filled with pea gravel, shingle, flint chippings, forest bark or similar materials, using either one for the whole garden or, more effectively, several contrasting colours and textures to emphasize the patterns. The knot garden is a masterpiece of precision, but it is not meant for cropping. A formal herb garden can, however, be both beautiful and useful. The shape must be regular for the best effect, but can be anything within those lines: square, rectangular, diamond, circular, semi-circular, oval or triangular. The focal point is marked by something like a sundial or a white-painted, old fashioned beehive (with or without occupants! ), a small pool or fountain, a small evergreen tree or clipped shrub, an ornament or even just a large, striking herb like angelica. Where the focal point falls is quite important, and depends on the shape of the garden, the direction from which it is approached, and many other factors. The dead centre of the herb garden is usually a safe bet, but if you can, try out some easily moved object in several different places, viewing it from all angles to see where it looks most comfortable. The natural focal point — the point to which the eye is most easily led — is not always where you might expect it to be. 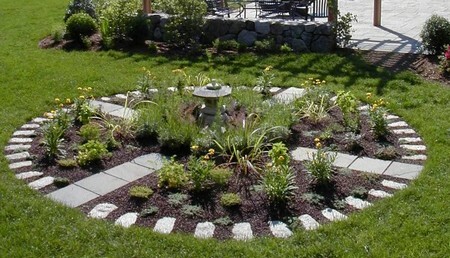 The rest of the herb garden design should radiate from that focal point. Use paths to form the basis of the design. (They have a practical value, too, for you should be able to reach every herb from paved ground.) Two intersecting paths dividing a square garden into four equal parts is a pleasing, simple and well-tried pattern. Where they intersect, you can position a seat, sundial, small pool or what you will. Plant fairly low-growing herbs near the centre of the garden with the taller ones towards the back. There are many more complicated designs you could work out for any particular shape, but remember not to make it too fiddly. Bold shapes and fairly simple patterns are usually the most effective. For many people the herb ‘garden’ is, in fact, just a bed. This too can be of a formal design: one that is both practical and pleasing is a chequerboard of plants and paving slabs. Don’t try to cram too many herbs into each planting space—one reasonable-sized bush or perhaps two smaller subjects is usually plenty. Great Article! This was a great read, I learned a lot. I just invented a table top herb garden called stem garden. I was wondering what types of herbs you think would grow best in it, given its unique design? I’d love to hear what you have to say. Please find me on facebook as Quirky’s Stem Garden to let me know what you think.